The year is 2350. The place is Salus - more popularly called Necropolis - the only habitable world left to mankind. Knights of the militant Sacri Ordines of theThird Reformation Church are locked in a bitter crusade against the Rephaim ("the dead ones"), a race of evil beings who wield necormantic powers with the desire to exgerminate all life. Yet even whenfaced with extinction, mankind cannot work together. While the Rephaimbatter at humanity's door, the Church andunionof Corporations continue their cold-war struggle for dominance over the lives of millions. 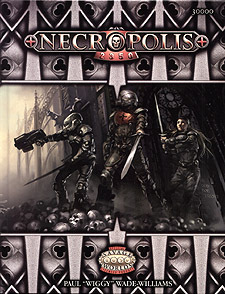 Necropolis 2350 is a dark futuristic setting for the award-winning Savage Worlds RPG. All that stands betweenoblivion and salvation are courage and faith.